CHICAGO -- The Oklahoma City Thunder saw a strange sight when their plane arrived at Midway Airport in Chicago Saturday morning. 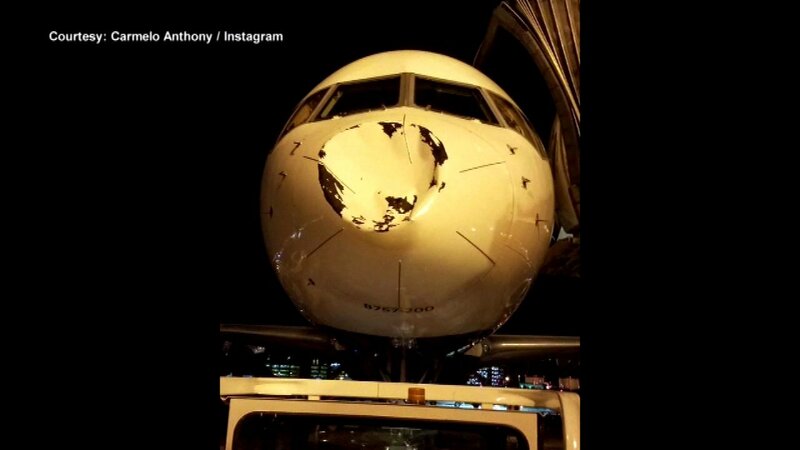 Several Thunder players posted photos on their social media showing the nose of their plane smashed in after landing shortly after 1 a.m..
Carmelo Anthony posted a photo with the caption, "What possibly could we have hit in the SKY at this time of night? Everyone is Safe, Though." Delta Airlines spokeswoman Elizabeth Wolf said in a statement that the plane, "sustained damage to its nose cone while on descent into Chicago." Delta said the flight from Minneapolis apparently encountered a bird when it was landing, causing the damage. The aircraft, a Boeing 757-200, landed without incident and customers deplaned normally. A team official told ESPN that the flight was a little rough, but not extreme or out of the ordinary. The Thunder were traveling from a game in Minnesota. They play the Bulls Saturday night at the United Center.